The Review will be back beginning with this weeks challenge. I’ll be attempting to do it again, if I can’t it’s been suggested that perhaps some volunteers would be willing to pick 20 Haiku and comment on them like I used to do. There will not be the elaborate set up as before. Straight to the haiku and comments without sections and things. Simple and easy. Click HERE for LINKS to last weeks Entries for Top&Light. Copy and paste the URL link of your finished haiku post into a comment here on the challenge post. I then know you did one, and we can all go visit your site to see what you have done. You can also do a ping back. What’s a ping back? Put the URL link from the address bar of this post, if you like, within your post. Your inclusion of the link encourages others to try the challenges out, be creative, and join a community to find friends and more followers (hopefully). I honestly gain nothing by more people visiting the post. I don’t have ads running I get paid for by your visit. look at an old life. Nice prompt words this week Ron..
Melissa, would this be the “lilting” of which I’ve heard, or something else? Hi Ron! I hope all is well with you. 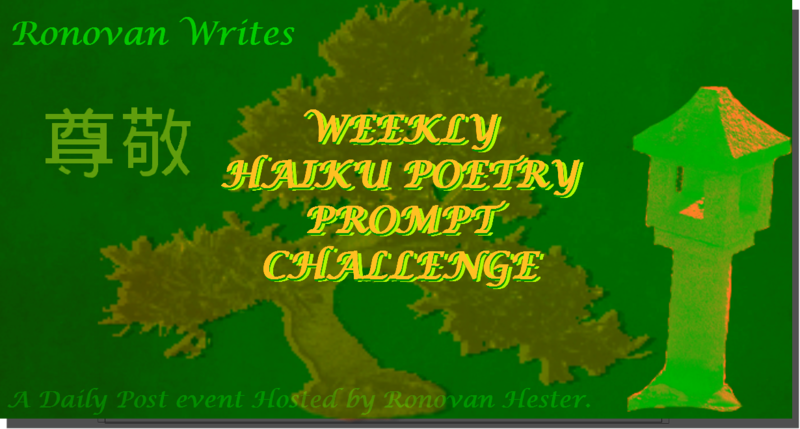 Thanks for hosting another week of the haiku prompt challenge. Here’s my contribution . . . http://wp.me/p3eYyj-1iR Have a great weekend!